You will earn 9,339 Reward Points. Earn 1 reward point for every 1 dollar spent. Secure-Temp 1.0™ is the industry’s first and only full service temperature monitoring solution for your kitchen. 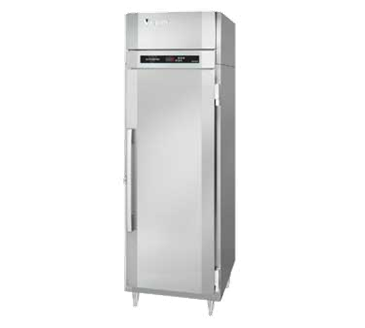 Secure-Temp 1.0™ is standard on all Victory models and is HACCP compliant and meets NAFEM’s data protocol. There is NO software or monthly monitoring fees. Optional add on kits are available for additional units in your kitchen that you want to monitor. The cabinet front and doors are constructed of heavy gauge, polished stainless steel to maintain an attractive appearance after years of heavy use. Polyurethane foam insulation throughout ensures the ultimate in energy efficiency. The front shroud lifts up to for easy access when cleaning the condenser unit. The doors are heavy gauge, polished stainless steel with a stainless steel interior liner. Each door is provided with a cylinder lock and ergonomically correct vertical handle. The door hinges are self-closing and have a hold-open feature at 120° which facilitates product loading. Proximity switches energize the recessed interior incandescent lighting when the door is opened. Humidity control wires around the door jamb prevent condensation from forming on the front of the cabinet in high humidity environments. The wires are concealed by a high impact, non-conducting thermal breaker cap. All components of the high efficiency, air-cooled, self-contained refrigeration system are mounted on top of the cabinet out of the food storage zone providing greater usable storage space. Environmentally friendly R-404a refrigerant is efficiently metered by an expansion valve providing a constant, safe operating temperature and quick “recovery” under the most demanding conditions. The hermetically sealed systems are designed to operate at 0° F. Each cooling coil has plasticized fin coils to resist food acids and dualspeed EC fan motor(s) for greater cooling capacity and efficiency. All condensate water is disposed of automatically by the energy efficient, non-electric condensate evaporator. Each cabinet section is provided with three heavy-duty, epoxy coated wire shelves. The shelves are adjustable in one inch increments. A wide door opening allows for the use of a variety of optional pan slide configurations including 18” x 26” and 12” x 20” pans. ENERGY SAVER - The cabinet automatically reverts to the energy saving mode when there are no door openings for four hours. SUPERCOOL - Provides a lower “set-point” refrigeration condition for a set period of time when food has just been loaded into the freezer and needs to be quickly brought back down to a safe temperature.